Ever Been to a Ghost Town? Yep, I can say I've been to a ghost town. They are pretty common in the desert Southwest. Rhyolite is an old abandoned gold mining town. just east of Death Valley. It sprang up in 1905 when gold was discovered in the nearby Bullfrog mountains. By 1911, the mine had closed and by 1920, the population had dropped to zero. At its peak, the town had an estimated 8000 -10,000 people. This is the old train depot. The town had three-story office buildings built of stone & concrete. This is the Cook Bank building. This home looked quite nice. One interesting building that is still standing is the Tom Kelly Bottle house. The house is made up of over 50,000 (mostly beer) bottles. No visit to a ghost town is complete until you visit the cemetary. This looks like an old cowboy grave. We explored Death valley for three days. and the unrelenting sun beats down from a cloudless sky. Our first stop was Dante's View where our first glimpse of the valley took our breath away. We are 5475 feet above the salt flats on the valley floor and Death Valley is spread out before us. 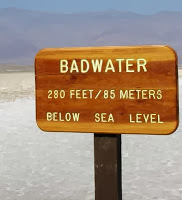 An hour later, we are walking the salt flats 282 feet below sea level. The ground is literally crystallized salt. There is little vegetation, but we still saw wonderful colors of rock. This is Artist's Palette along Artist's Drive. There are many places to hike. My favorite hike was Mosaic Canyon. and a mosaic of embedded rocks in other places. The Mesquite Flats sand dunes are fun to climb up & run or slide down. The day we were there, however, the wind had picked up and sand was blowing in our eyes. There is water in Death Valley and you can hike along Salt Creek for a different experience. Just don't drink the water. And Scotty's Castle is a surprising sight in the middle of the desert. This is Ubehebe Crater, a volcanic crater in the northern park of the park. We made the exhilerating drive up Red Pass and through Titus Canyon. Probably one of the scariest roads we've been on, but wow, what an experience! The canyon walls rise 500 feet above as we drive through the canyon. Zabriskie Point is a good place to watch the sunset. You gotta go see Death valley! We are visiting a national park. Its not like any other place on earth, in fact, its more like the moon. Here's some images found around the park. I'm in Death Valley, one of the most unique places in the world!